John and Margarita Gaberino could tell Margarita’s mother was worried. It was 2001, and she’d come up from El Salvador to visit them in their home in Tulsa, Oklahoma-and also, it seemed, to relay some bad news. The family coffee farm, which had been started in 1870 by Margarita’s great-great-grandfather, was faltering. A global coffee glut had caused prices to drop to the point that it cost more money to produce a pound of coffee than a Salvadoran farmer could earn by selling it. Coffee plantations across El Salvador had been selling out or firing employees to cut costs. Margarita’s mother couldn’t bear to do either. “We were sitting on the couch one night talking about it into the late hours,” recalls John. 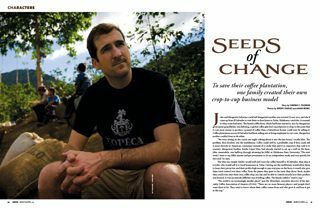 The problem, they decided, was the middleman: Coffee could still be a profitable crop if they could sell it more directly to American consumers instead of to mills that sold it to importers that sold it to roasters. Margarita’s brother, Emilio López Díaz, had already started to set up a mill on the farm. John, meanwhile, was halfway through attaining his MBA at Oklahoma State University. “The next week I went to my MBA classes and got permission to do an independent study and very quickly hit the road,” he says. So in order to sell the good stuff himself, he needed to learn. He attended SCAA seminars and flew down to El Salvador to see the coffee being grown. He went to conferences. He joined the Roasters Guild. “I ended up spending three to four years just developing my own knowledge base and learning about the market and the chemistry,” he says. At the same time, he needed to educate Tulsa, a city without much experience with quality coffee. “I realized I had to be a salesman,” he says. He persuaded a local gourmet grocery store to let him set up a kiosk selling Topéca Coffee. (The name came from Margarita’s childhood nickname.) “We were working from 6 in the morning to 10 at night-mostly John-and giving every customer our story,” says Margarita, who spent much of those early years home raising their two children, Isabella and Matthew, now 8 and 5, respectively. Lola Palazzo remembers meeting John at the kiosk shortly after she’d moved to Tulsa five years ago. “I was totally impressed,” she says. “I’d worked with Susan Ohori in Santa Fe, and she’d learned how to roast coffee at Peet’s in San Francisco. And he made me a coffee and I thought, ‘Wow, this is amazing.’ ” When Palazzo opened her own restaurant, Lola’s at the Bowery, in 2004, she picked Topéca as her coffee supplier. She wasn’t alone. John had been dutifully pounding the pavement, getting his coffee sold in local groceries, served at local restaurants and supplied to local offices. Some people were wooed by the taste, others by the fact that Gaberino was a local boy, the son of a prominent attorney. Still others liked the fact that their money was going directly to the farmers planting and harvesting the coffee. Both John and Emilio López Díaz had grown more experienced in making coffee, and now that they could roast their beans freshly as needed, the quality of their end product rose dramatically. They created their own single-origin espresso-something still a rarity at that time. And they began garnering attention outside of Tulsa. In 2006, Topéca was a finalist in the El Savador’s Cup of Excellence coffee competition. The next year, the company was one of three semi-finalists for Roast Magazine‘s Roaster of the Year-and was again in 2008. In El Salvador, where most coffee plantations pay migrant workers a barely living wage to pick coffee seasonally, Topéca maintains a staff of some 40 full-time employees who receive both healthcare and salaries 10 to 15 percent above the industry average. They’re also cross-trained, which means that the person who picks the beans often has a full understanding of the washing and drying processes, as well. The company supports its local schools and has funded the college education of one of its employees. It’s a major contributor to Libras de Amor, a nonprofit providing nutrition and healthcare in rural El Salvador. Mostly, they want to make sure a fifth-generation business makes it to the sixth generation. As to that, things are looking hopeful. “Our son said just the other day that he wants to be a roaster when he grows up,” says Margarita. Joe Carroll’s recipe for wine-bottle sauce is absurdly easy (and fun) to make.